In an environment of patchy and volatile market performance, increasing margin pressures and ever-greater customer demands, there is a renewed urgency for B2B organisations to leverage segmentation to improve customer intimacy and unlocking the value of their database. The B2B sector has consistently been underserved in customer-level data and off the shelf solutions for segmentation, so the urgency is even greater to ‘get it right’ when designing and building a bespoke solution for greater data insight. 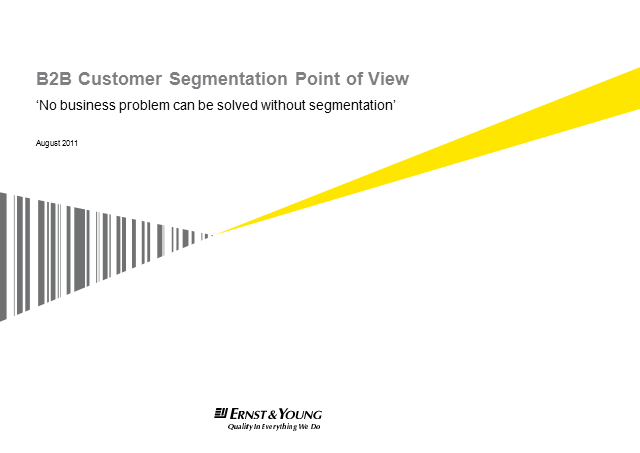 Ioannis Melas and Steven Keyes from Ernst & Young will outline how B2B segmentation can help organisations optimise commercial performance and compete more effectively in today’s market conditions. • An overview of the common pitfalls of implementing segmentation and how to avoid them. • An honest look at the ‘trade-offs’ involved in designing the appropriate segmentation solution and how to navigate them based on the unique characteristics of your organisation. • An action-oriented point of view for realising value through segmentation based on the ability to adapt insight and drive change without massive data enhancement exercises.